I recently received a mail from an avid reader of divinetaste which amidst other things stated that she admires my beautiful life. Life of course is a mixture of many things, happiness, sadness, victory, defeat, tears and laughter and just as the seasons change, so does life itself. And my life too mirrors these expressions of change that life itself brings about. Perhaps, this has been the longest break I have taken here and this has been due to a turn of certain events in my life. But, I hope to comeback with a lot of exciting things in the new future. All the recipe requests made to me sit neatly in a folder and I hope to cater to them too, turn by turn. I hope you will have the patience to bear with me till that happens. 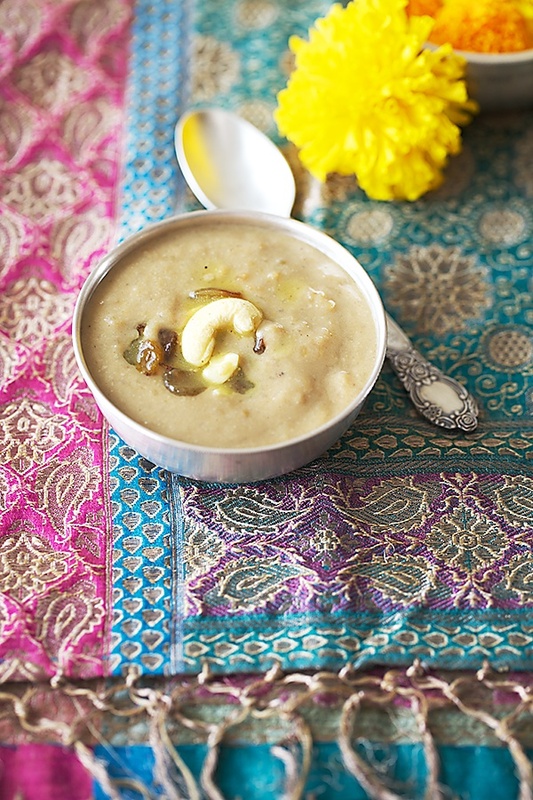 Payasam, payasa or payesh or kheer as it is known in northern India is one of the integral components of Indian cooking, having been cooked for generations since thousands of years. 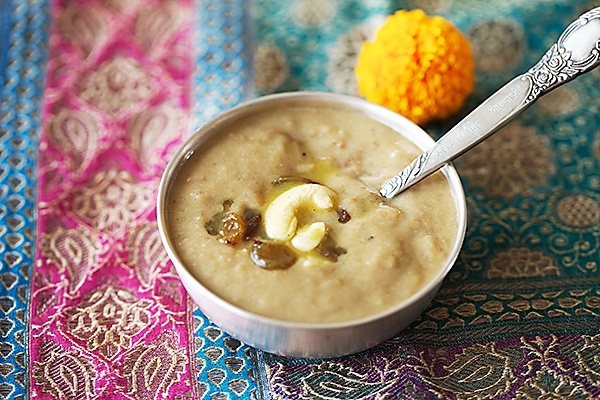 Moong Dal Payasam, a traditional vedic recipe is one of my personal favourites. And it features three of my favourite ingredients that are brimming with nutrition and taste, mung dal, coconut and jaggery. Mung dal enjoys a high status in Ayurvedic cooking as it is considered to be the least flatulent amongst dals. According to K.T. Achaya Buddha recommends it in a group of foods that is "full of soul qualities" and "devoid of faults". I clearly can't fathom the fuss around coconut these days. My grandmothers have used it profusely in cooking and continue to do so even now. Mind you, they are well into their eighties and can’t do without their daily fix of coconut. I follow suit and use it regularly wherever the dish calls for it. Of course moderation is key but apart from the nutritional significance of coconut, my grandmother has a simple home remedy for most ailments-coconut oil! And jaggery happens to be the most unrefined form of sugar. Packed with nutrients, great for digestion and a remedy for many diseases. I have an incurable sweet tooth and if I dont have a sweet on hand after a meal, I’m always haapy to pop in a piece of jaggery into my mouth. And ofcourse, I love to cook with it. Jaggery has made its way into my cakes, cookies and many other dishes from savoury to sweet. The colour of this payasam depends on the colour of the jaggery used. 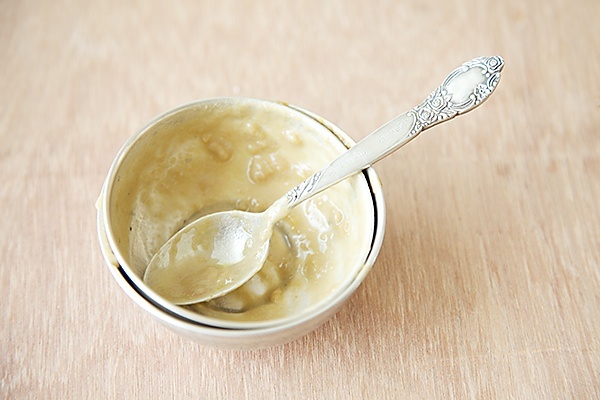 Although I use only unrefined organic jaggery and not the bleached lighter colour variety, I have had different shades of colour in this payasam based on various kinds of jaggery. When I made it recently it had the most gorgeous golden brown colours which would have photographed better but unfortunately the batch of payasam I made the day I took these pictures don’t showcase the vibrant hues of the payasam. But, as far as it tastes good, it doesnt matter. And this tastes fabulous! Make it for a festive lunch or dinner or incorporate it into an everyday meal when you are craving something sweet. The perfect hint of sweetness and balance of the three prime ingredients make this an exotic yet simple and homely dish. I have not had a single person whom I have served this dish to, not like it! And this is so very good for growing children. I’m glad that my little fellow likes it too. P.S.-thanks once again for all the emails and messages and for writing to me. That plays a major role in inspiring me to continue writing here. You can use ready made coconut milk. But, nothing can beat the freshness and taste of freshly squeezed coconut milk. 100 gm (1 cup) fresh or frozen coconut shreds,if making your own coconut milk. 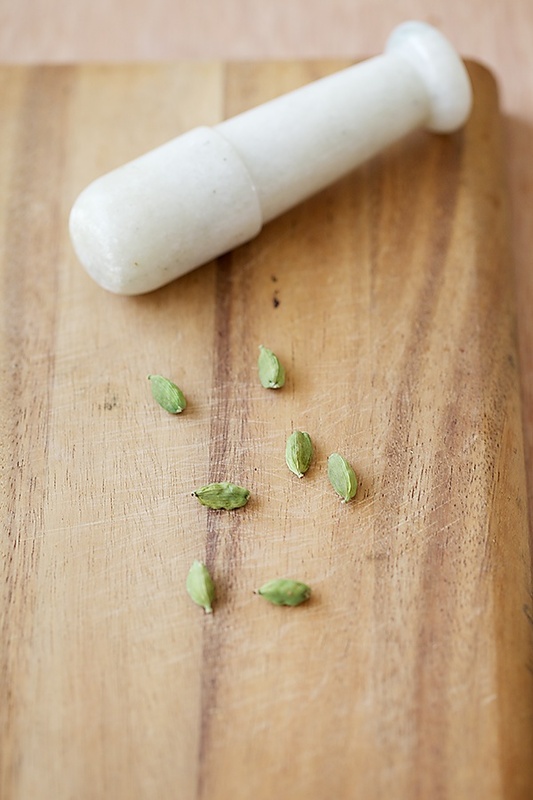 Dry roast the moong dal for about 4 to 5 minutes, until it turns a light brown in colour and acquires a nutty flavour. Allow to cool. Wash the mung dal and cook the with 2 1/2 cups of water for about 2 whistles. If you are using non organic dal, then 1 whistle should do. Meanwhile make the coconut milk. Place 1 cup coconut in a blender and pour 1 cup lukewarm water. Keep aside for 10 to 15 minutes. If you dont have the time then proceed further. Blend to a smooth paste. Extract the milk with the help of a strainer by squeezing all the liquid. This is the first extract. 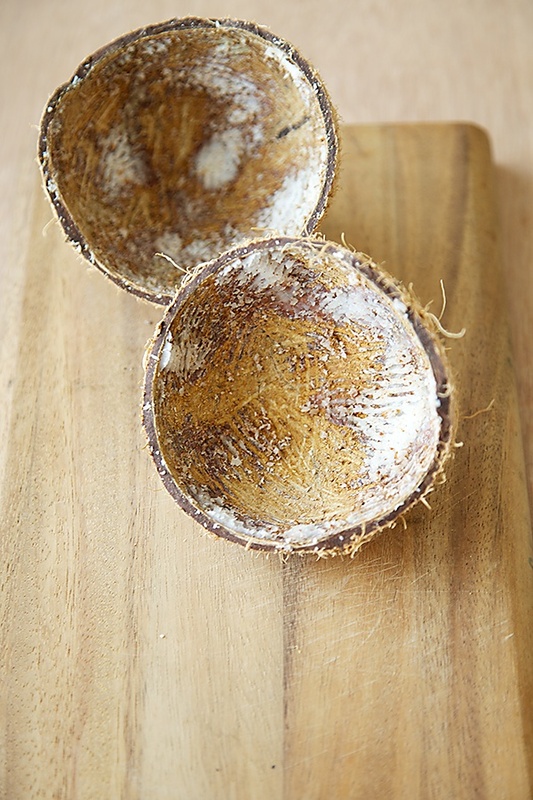 Make the 2nd extract by pouring another cup of water to the remaining coconut shreds and repeat the process. After the pressure comes down, add the jaggery and cook till it turns thick, this should take about 12 to 15 minutes. Stir in the coconut milk from the 2nd extract and bring to a boil. Lower the heat and mix in the coconut milk from the first extract. Cook for 3 to 4 minutes and turn off the heat. 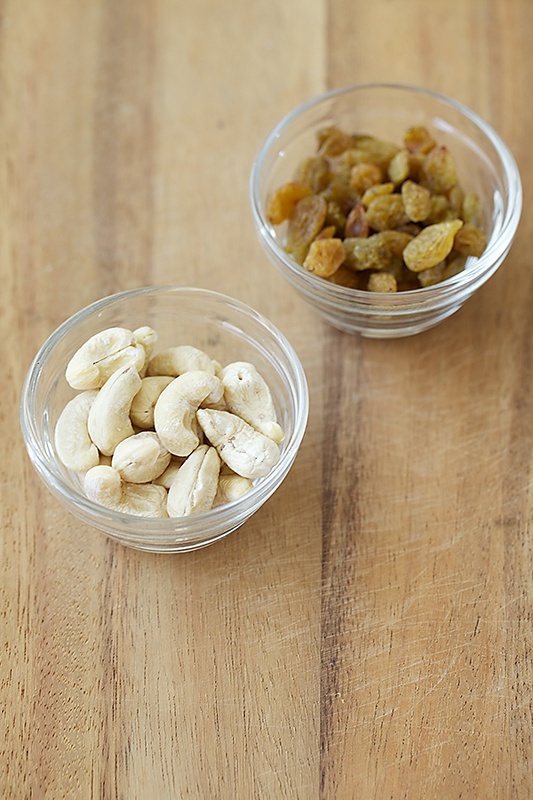 In a small seasoning pan, heat the ghee, add the cashews and when they turn a light golden brown, put in the raisins. Turn off the heat. Mix in the dry fruits and the powdered cardamom. Lovely dessert and fabulous pictures. Have been a silent follower of your blog but have'nt commented yet. Thank you for a load of delightful recipes… Paneer makhni being my kids favourite… And the cakes have been an absolute pleasure to make.. Once again thank you very much. It's such a pleasure to come visit your blog after a long hiatus and see yet another great recipe,Though I regularly browse through your delightful recipes and have made quite a lot of things and I must say..Till date whatever I have made it has turned out to be one of the best things served..It's full proof and can never go wrong..Looking forward for many more…..
Wishing you and your family a very Happy Diwali and a Joyous New Year !! Rashmi: Thanks for breaking the silence and taking the time to comment. A glad you love my recipes. Ruchita: Happy to get your feedback Ruchita. Happy Diwali to you too. lovely recipe …will be certainly trying this one . just a query -are you using mung dal with skin or without ? 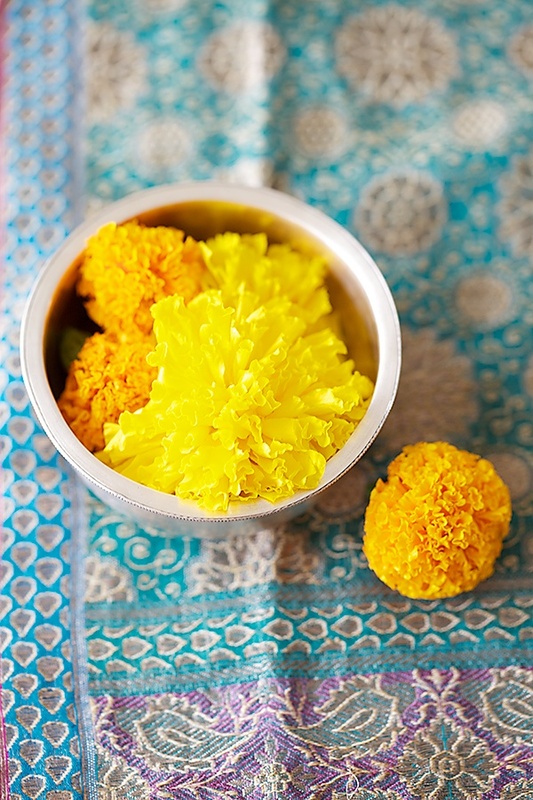 neet: Yellow mung dal without skin is used here. Good luck! I've been following your blog for the past few months and I must say that I'm totally loving it. Though I've tried only a few recipes from your blog, I keep coming to your blog to read your beautiful write up of life, family and the common place things of everyday life. You have a great flair for making even simple things worth admiring through your words and your stunning photography complements your words. Above everything I greatly admire you for the principle behind your cooking i.e sattvik food. With the world going crazy behind frozen ready made meals and processed food, I feel that blogs like yours are a great attempt in bringing back the glory of cooking from scratch to limelight. Keep up your good work. Love Moong Dal Payasam. I am planning to use store-bought coconut milk for this recipe – can you tell me what quantity I should be using. Thanks for all your good work. Have tried a couple of recipes from here and they came out perfectly well – all thanks to your precise measurements! Geetha:Thanks for your kind words. I really appreciate it. Divyangi: Use one cup undiluted and i cup diluted coconut milk i.e 1/2 cup coconut milk and 1/2 cup water. You will have to thinks of ways of using up the remaining batter. Good to c u back….it has been a long wait indeed but a good one Divine taste has always filled colours to our empty spaces in life…and what to speak of this post very frequently prepared Kheer in Karnatak lot of memories attached to it,My sister's most fav sweet dish.Coincidentally her B'day was on 3rd november and Mom used to prepare this Kheer every year on her b'day. How are you doing Anushruti? Hope you are doing good. I love moong dal payasam as it has this slightly chewy texture. It kinda sticks to your teeth! With jaggery and then the cocunuts, it must taste like a piece of heaven. This kheer turned out great.It was truly DIVINE..the sweet taste of coconut,jaggery and subtleness of moong dal, i felt transported to heaven.Thanks a lot.Me and my son had this kheer for breakfast,lunch and dinner yesterday. :) Thanks a million. Sunitha: You are welcome! Glad you like it. It is one of my comfort foods. Yummy pics as usual.Keen on picking up recipes made with Jaggery. Can you suggest a substitute for coconut milk? 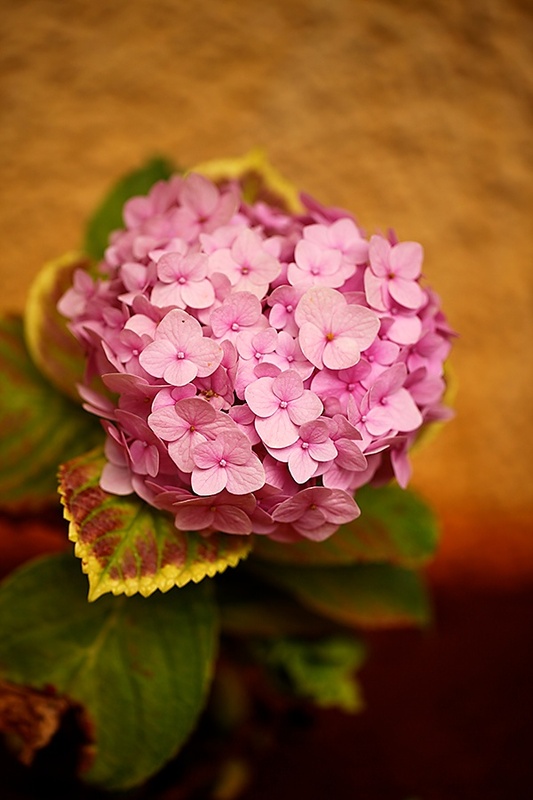 For people allergic to it…this is a valuable source of info! Amruta: Thank you for your festival greetings. Wish you the same. The alternative for coconut milk would be cows milk or almond milk here. That helps a lot Anushruti!